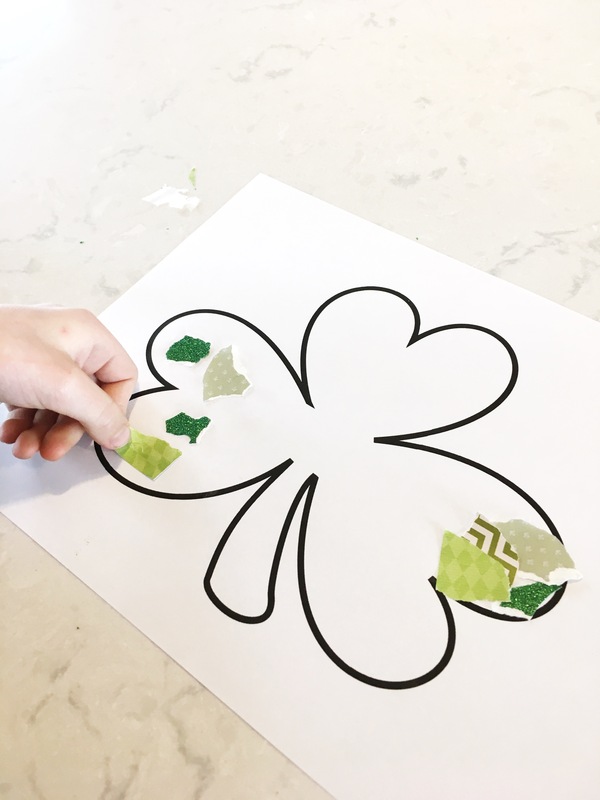 This St.Patrick’s Day craft for kids is so easy, so simple, and oh so fun for preschoolers and toddlers. 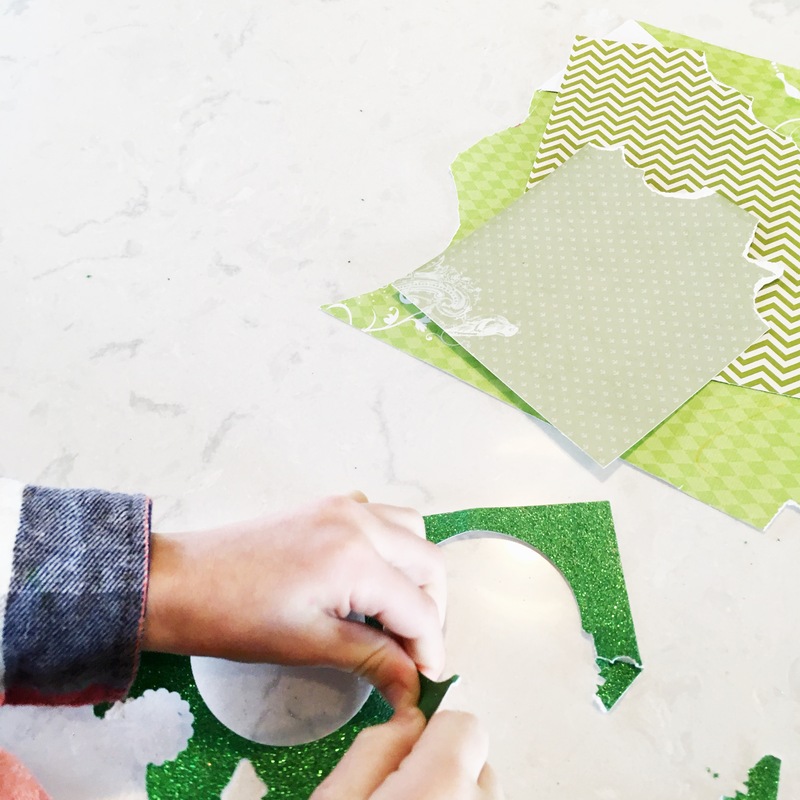 I love finding fun crafts for kids that are actually helping their little bodies develop. I am a fan of multi tasking BTW! This craft is fantastic for helping the little ones develop their fine motor skills. It requires a lot of tearing, or cutting, which will strengthen those little finger muscles….all while having a little fun! Now let your sweet little get to work. 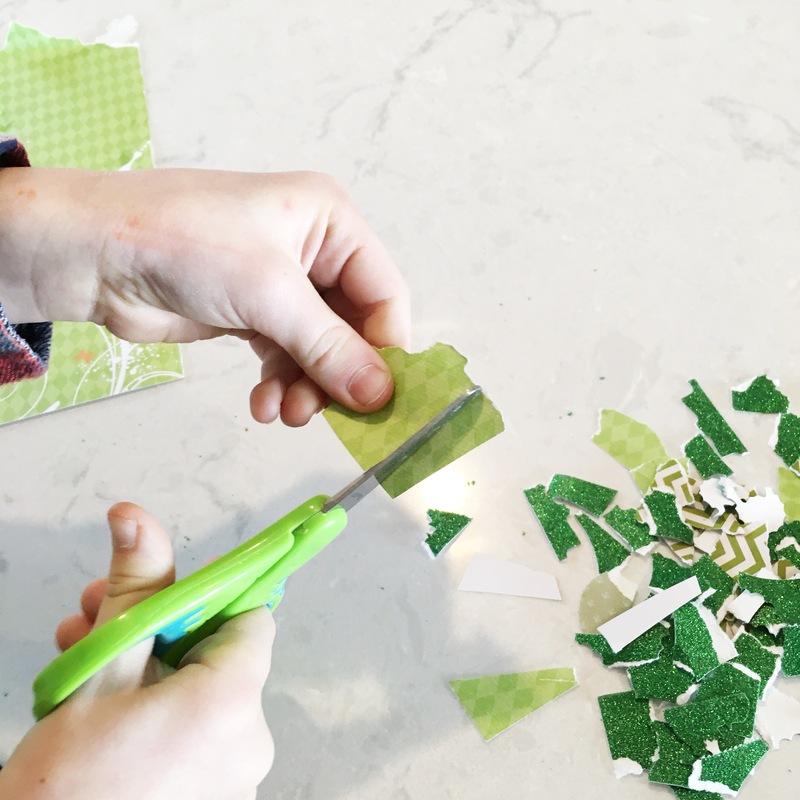 Encourage them to rip the papers into small pieces. My son got a little tired of ripping and decided to get his scissors out and cut pieces. Do whichever works for you and your littles. 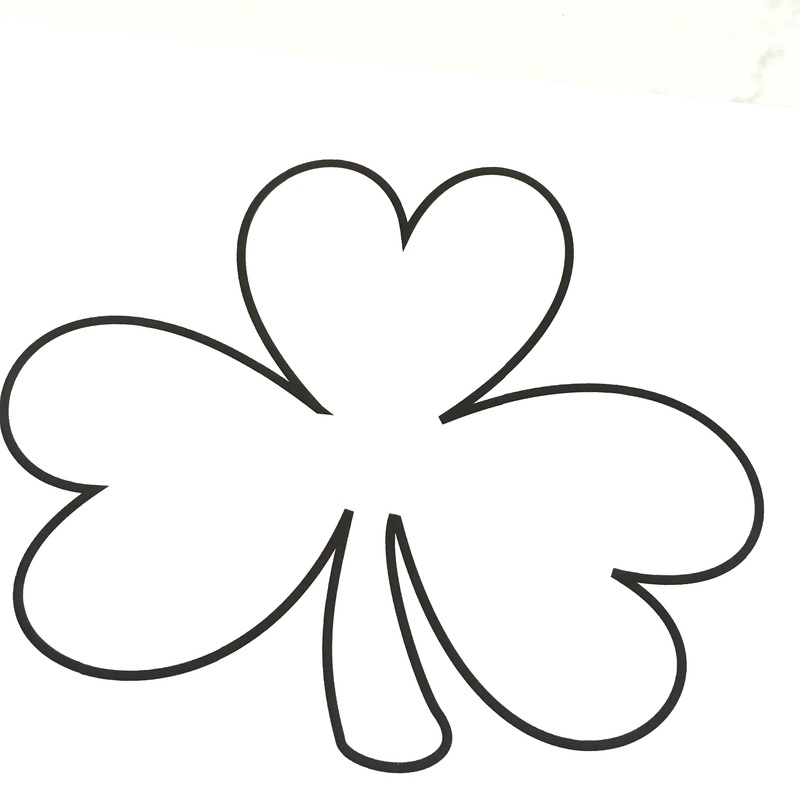 Once you have a nice pile of green shredded paper have your child glue the pieces onto the shamrock. We decided to turn this into a group effort, I glued and he stuck the papers on. 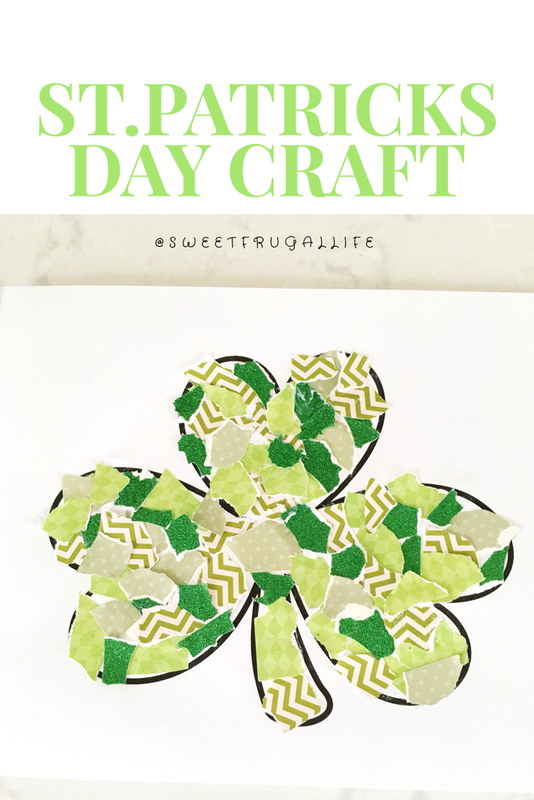 It was fun to spend some time together crafting and discussing St.Patrick’s. 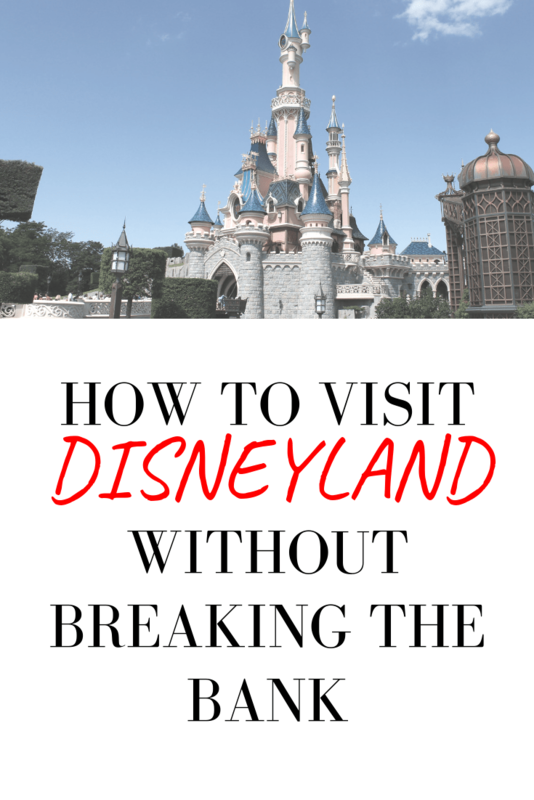 This was such a fun activity. 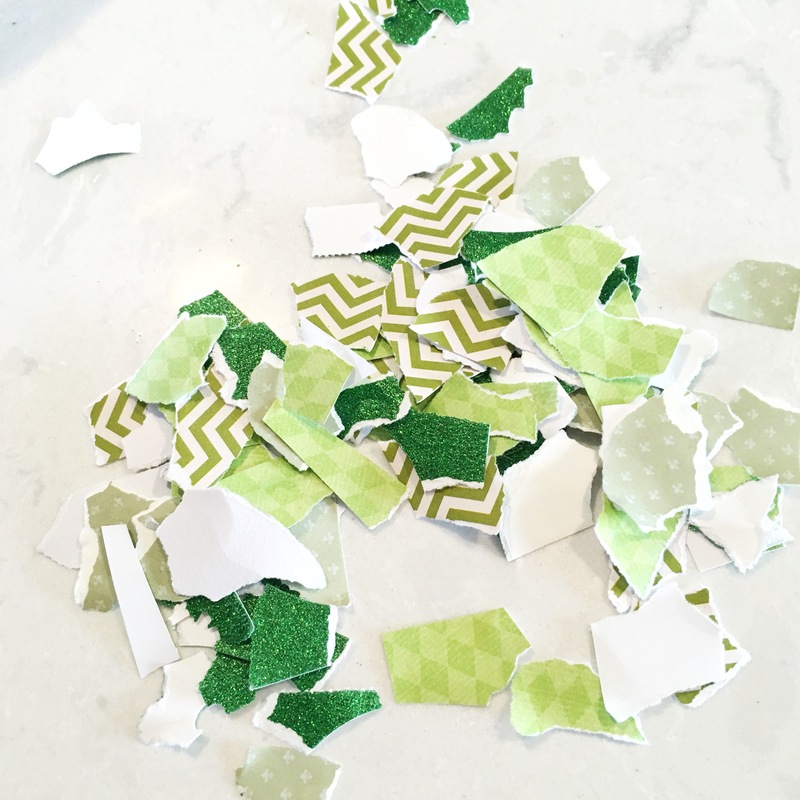 I love doing things these simple craft projects, especially when I already have all the supplies on hand. 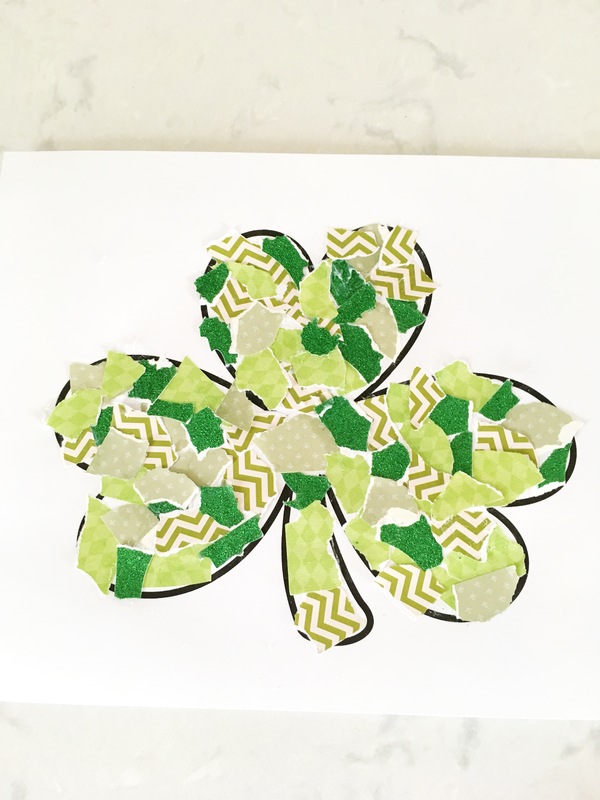 How are you prepping for St.Patricks day with your kids? So much fun to put glue, scissors and paper together with sticky little hands. 🙂 This is a really cute idea. I love that these are so simple and doable for little hands! And I love that you just used what you had on hand. 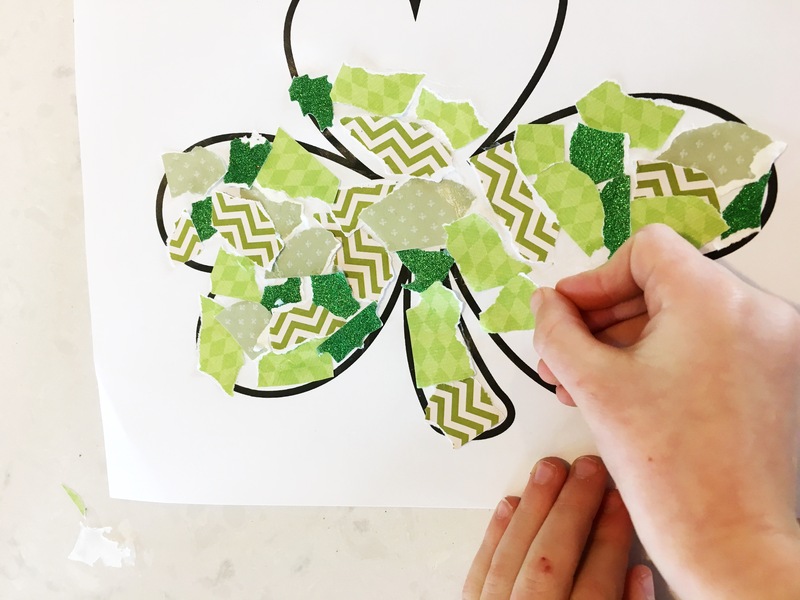 Process-oriented art is such a great way for kiddos to learn and grow! 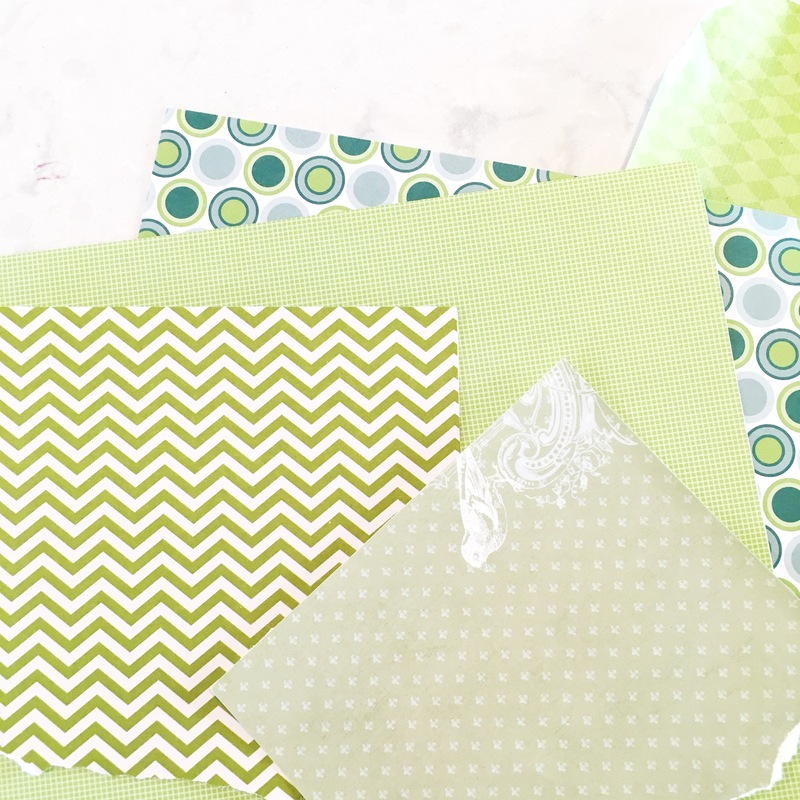 I have a huge pile of leftover scrapbook paper that will be perfect for this craft project! Yes! That’s really all you need! super cute idea and great for a wide variety of ages. Older kids can make this more complex. Younger kids can work with mom or dad. 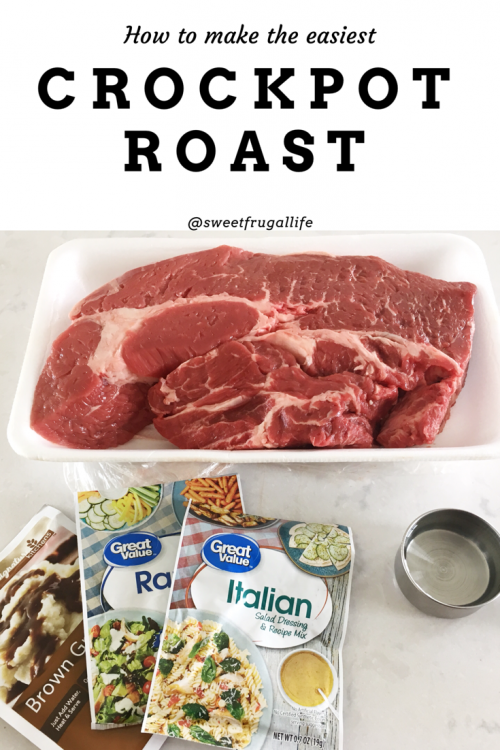 You can take this idea and apply it to any holiday… a Valentine’s heart, a pumpkin, a Christmas wreath, or any shape or outline form. I love simple activities that allow children to create! This is so cute! My toddler would love putting this together. He loves ripping up paper LOL!! Yes! They will love it!